Santorini is a dream destination. We had heard of the cave hotels built into side of high cliffs and we'd seen yogurt commercials showcasing the blue and white villages situated in paradise, but until we laid eyes upon the island of Thera, we never truly understood the beauty this land possessed. We arrived early in the morning from Athens. The drive from the airport was uninspiring, but once our taxi let us off and we walked to the cliff’s edge towards our cave hotel located in Imerovigli, we gasped in awe. This place is truly breathtaking. White and blue cement buildings line the edge of the cliffside town with long pathways leading down to luxurious boutique hotels. Cave hotels in Santorini are all the rage. They are old cave houses renovated to beautiful boutique rooms carved into the side of the rocky cliffs. Residents of Santorini built these caves to blend into the rocks to hide from pirates, but today, they have been remodelled to rooms of pure bliss and luxury. We were staying in the Iconic Santorini cave hotel. When we received the invitation offering us two nights in this luxurious accommodation, I don’t think they expected us to take them up on the offer so soon. We were already going to be in Greece for a conference, so a couple of days relaxing in Santorini was definitely on the agenda. The staff met us at the top of the cliff to take our luggage down the long narrow stairs. There are no escalators or elevators in Santorini so a lot of walking up and down narrow passages is on the agenda. It’s worth the extra effort to stay in one of these Cliffside villas though, as you are immediately transformed to a world of luxury. Great amenities like this infinity pool. It was near the end of the season so we were lucky to be able to check into our room even though it was only 7:00 am. We were treated to fresh fruit juice and hot towels upon check in, and immediately felt refreshed after the early morning start from Athens. As our luggage was taken to our room, we were shown all the amenities the hotel has to offer. A beautiful infinity pool, spa and massage, soaker tubs, and fine dining were on the agenda for the next couple of days. But it was the room that really stood out. The staff showed us to our domed room built on the side of a cliff. It definitely looked like a cave, but this wasn’t a bare bones rocky cavern. It was a luxurious room mixed with chic bedding and traditional design. I have to get one of these Cocomat beds. They even took time to talk to us about our bed! Each room has the award winning coco-mat mattresses with high grade sheets and thick duvets. I don’t think I have ever slept so well. I’ve been suffering from neck pain for quite sometime, but with the combination of the bed and high end pillows, my pain disappeared during our stay on the island. Santorini is a place where you simply relax. For our first two days on the island with Iconic Santorini, we did nothing but stay in the hotel. Each morning, breakfast was brought to our private balcony where we sat outside eating yogurt and honey, and assortments of fresh breads and cheeses accompanied with rich cappuccinos and freshly squeezed juice. You would think that would be enough, but we also had eggs to order and pastries to savour. I dreamed of breakfast each evening. Deb enjoys some Greek Yogurt on our balcony. Days started late here. We slept in for the first time in months and ate leisurely at our own pace. We then went back to our room to relax and enjoy some light reading or writing before heading out to the pool for some more sunshine and tranquility. There are so many little nooks and crannies to get lost in. We barely saw another person as we had our own lounge chairs in front of our room or we could sit in one of the many levels to the hotel. As the day went on, the inviting bed lured us back for a mid day siesta. I can only imagine how hot it must be in Santorini during the summer months and to escape to a room build into the stone would be a welcome reprieve. We visited near the end of the season and while the weather was still amazing at a balmy 27 degrees Celcius, we had no crowds to deal with and could enjoy Santorini in peace. Many people run over to the neighbouring city Oia to watch the sun go down. The crowds at the abandoned castle can be overwhelming there, but we had the privilege of watching sunset from the privacy and seclusion of Iconic Santorini. We delighted in quiet dinners by the pool relishing delicious Greek foods like muscles saganaki and souvlaki. Santorini is proud of its wine production and a bottle of wine accompanying the delicious flavours is a must. What a menu for dinner! Ordering a second bottle to take back to our terrace, we spent the night sitting outside taking in the moment and realizing just how lucky we were to be there. A cat came up to our door that reminded us of our old cat Louie. It snuggled on Dave’s lap for quite some time before deciding that it had enough of us and set off to hunt. It was funny how it just turned off. Once minute it was snuggling and purring and we worried that it would want to follow us in our room, but the next it decided it had it’s fill of loving for the night and set off for a more adventurous evening in the streets. We don’t normally write about a hotel experience. But spending two days in paradise is worth the dedicated post. As I started writing, I had visions of writing about our thoughts and feeling of seeing Santorini for the first time, but as it evolved, I realized that our first thoughts and feelings about the island just so happened to take place at Iconic Santorini itself. And it was pure heaven. For more information on staying in Santorini, visit the Iconic Santorini boutique cave hotel website. 18 Responses to "Iconic Santorini: A Cave Hotel Experience"
Staying at a cave hotel, how cool is that, not what first comes to mind for a cave. Great pictures. I love your Hotels reviews, I like to read from “professional travelers” like you two and I always find ideas for future travels. I hope to start posting guest posts and guest interviews of travelers like you two. Happy travels and hope to meet up sometime. Thanks Martin. We’ll try and do more reviews. I find that we tend to neglect the hotels that we stay in when we are lucky enough to be able to spend time in some amazing places. Hearing your comment makes me think that we will do more! It is a fantastic hotel! I disagree , Santorini is a volcanic Island , without greenery, but is the most luxury island of GREECE. It sounds like it was an incredible hotel! I love the outside view you had! Thanks for sharing your stay! Thanks! The view was unbelievable. I don’t think we’ve had that type of reaction to a destination in years. We literally gasped when we walked up to the cliff edge after our cab ride and saw the island for the first time. Our room was very spacious with the lots of windows at the front. We didn’t feel claustrophobic at all, but I have a feeling these rooms are little bigger than others. The place looks like paradise and it sounds really great that you are staying at Iconic Santorini cave hotel for two days. Thanks for sharing the wonderful snaps. This place looks great! 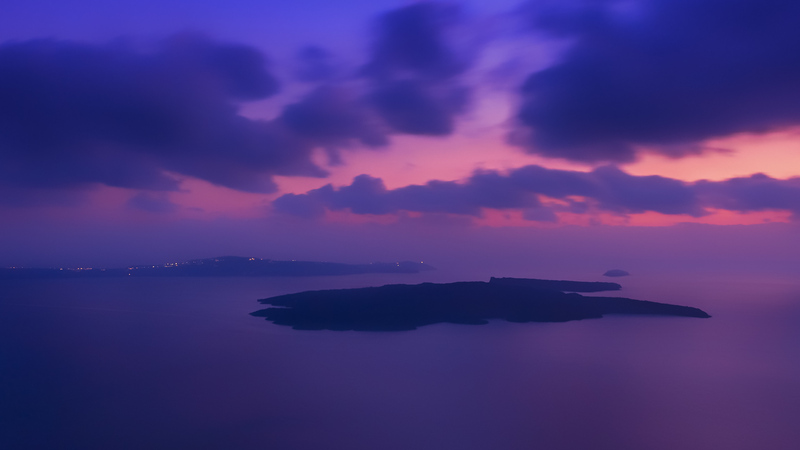 We hope to go to Santorini sometime in 2015! We will be checking out the cave hotel now! You will love it Paul. Make sure you try the Iconic Santorini. If not, make sure you at least splurge on a night or two in a luxury cave hotel with infinity pool. It is a must in Santorini and the experience just isn’t the same without romance and luxury for a night or two. beautiful hotel…but it is out of my budget..